I stood in line outside a bar in downtown Tucson last week. I wasn't waiting to see a band play or to be served alcohol, but to try out for a game show. As I stood in line I realized that the last time I was at this bar (or any bar for that matter) was to participate in another event. I came in 6th that time, barely beating a team that I think was drunk at the time. I did however appreciate his George W. Bush crop top. I would drink to that! I was feeling upbeat and excited until they handed out the applications. Never before have I applied for anything that has asked me about my athletic ability. The first time I rollerbladed was on a Saturday afternoon in an empty elementary school parking lot. One other car was in the lot besides my own. Halfway through the first lap around the lot I realized I didn't know how to brake. I subsequently careened downhill into the other parked car and nearly tore off its side mirror. This memory was symbolic of how the rest of the application would make me feel. Gaining steady downhill momentum. Tell us something about you that we couldn't tell by looking at you! Hmm...that I hate this application? I decided to call my husband and see what leapt to the forefront of his mind. "Please don't tell them that you don't wear underwear" he said. "Do you think I'm stupid? I only share that with close friends and the hospital staff that had to cut my pants off of me when I was in that car accident. Think of something else. Something witty and interesting that will get me on the show!" So my 8 year old son tells me "You're a really good baker, Mommy!" It's nice to know someone appreciated the pumpkin muffins last week. Too bad I didn't bring any with me to the interview. I glanced over the shoulder of the woman in line ahead of me. She had already written 3 paragraphs answering that question. I skipped it and went on to the next one. What's the most embarrasing thing that ever happened to you? I should've put down the application right there on the sidewalk and made some apologies about having forgotten to turn off the oven at home. Exactly how much am I willing to divulge on national television? Since the no underwear issue had already been discussed, I was at a loss. Do I want to brag about getting knocked up by my next door neighbor and marrying him before he ever met my father? Sure, nine years of marriage and two kids proves it wasn't all that stupid, but it sounds downright assinine when I hear about it on talk shows. I was trying out for a show hosted by Howie Mandel, not Jerry Springer. Next, I was led upstairs to the interview area with 9 other people. The woman to my right started immediately jockeying for position and blurted out her plans if she should win a million dollars. "I'm going to continue to work on the new breed of horses called Pintarabians"
Not to be outdone, a very tan grandmother seduced the casting director with stories about her and her twin sister. I stood there, marveling at the self promoting skills of these people and their insane desire to be on television. One gentleman discussed his embarrasment over seeing another cast member do a leg lift during Fiddler on the Roof when she had forgotten to put on her underwear. Initially horrified, I realized that I had never been in a play so it couldn't be me that he was talking about. I did however pee out of the second floor window of someone's house once. That would make me a Piddler on the Roof. Yet, it was just another story that I couldn't bring myself to share. Before I knew it, the interview was over. Two people were held back for the second round of interviews. I walked down the stairs of that bar as a loser for the second time. If I had made it on the show, I would've been in LA tonight (Monday night). Instead, I'll be sitting at home, underwearless and eating muffins, watching Grannie and The Horse Whisperer take home a briefcase full of cash. I'm thankful we don't have a DVD player constantly running in our car. I'd miss out on the entertaining conversations that take place in the backseat when an 8 year old and 4 year old observe their surroundings at 55 mph. Last week my son pointed at a hotel and told his sister "That's where some people live if they can't afford a home". She pondered that as we continued to drive. We approached a cemetary and she pointed at the expanse of land that was dotted with headstones "Oh yeah? Well, that's where people go when they get grounded". If anyone wants some fresh lemons, let me know. I am having nightmares about them taking over our home. 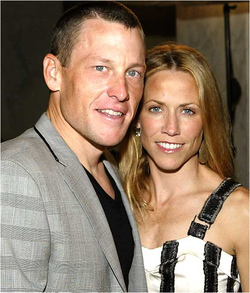 I bet the real reason Sheryl Crow and Lance Armstrong just split up is because they had blood work done that proved them to be related. The way their upper lip sorta curls under on one side, like I used my photoshop smudge tool to drag it down, just an iota. Or like they had some sort of hairlip issue at birth. The same color eyes, the chiseled chin, the slightly undernourished look, the flash reflecting forehead. I don't know about you, but I would never date a guy, especially a relative! that made me wear a dress fashioned out of bicycle handlebar tape. Does anyone know any multi-tasking men? My husband can fix/build/understand just about anything. He just can't do anything else at the same time he is fixing/building/understanding. Fixing a broken shower door? Not a prob. Just don't ask him how long it will be until you can actually take a shower, because he cannot process questions while calculating the exact angle a door needs to be hung. Build a bed from a few planks of wood for our son in a single afternoon in our family room? Of course he can. Ask him to put the laundry into the dryer as he is passing by the laundry room on his way to the family room to build the bed? Ain't gonna happen. So, I guess that explains what happened when he was on his way to work yesterday morning. He came in the kitchen (where I seem to live in a constant state of dishwashing) to say "Goodbye". I handed him the bulging bag of trash and asked if he could dump it in the trash can (located mere steps from his 4Runner in the garage). 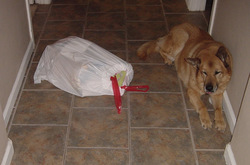 He took the bag and walked down the hall. Here's what I found when I came out of the kitchen a half hour later. Guess who stopped at the bathroom on his way to the garage?